Awarded the Frank j. Selke trophy in 1992-93 for demonstrating the most skill in the defensive component of the game, Doug Gilmour was in his second season with the Toronto Maple Leafs, where he would set the club’s single-season record for both assist (95) and points (127). The 1992-93 season would also witness the Kingston native earning his first of two All-Star game appearances. This signed Campbell Conference jersey was worn by Gilmour in the 1993 NHL All-Star Game. Maska Air-Knit and “52” size tagging rest along the collar, with embroidered NHL and CCM patches over the reverse bottom hem. Styled with a gorgeous NHL shield crest and dual-colour numbers, a row of tackle twill stars have been placed over the front and reverse lower band. 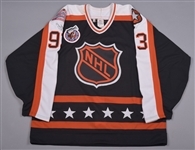 The Stanley Cup 100th anniversary patch sits over the right breast, with the 1993 All-Star Game crest atop the right shoulder. A signed LOA from Doug Gilmour will accompany. Noticeable game-wear includes just a few faint marks over each sleeve, along with a dark mark over one of the affixed stars on the lower front. 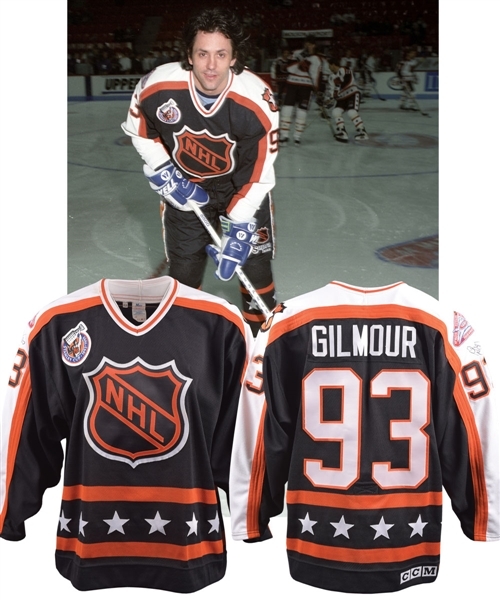 Gilmour has signed between the numbers and All-Star Game patch on the upper right sleeve adding “93”, with minimal fading or bleeding.